ST. PETERSBURG — Diana Williams, a retired daycare provider, lives in a concrete block home in St. Petersburg. The hot sun glares through her broken front window while the air conditioner runs nonstop. The hot water heater rumbles and bedroom closets reveal open holes around piping. Williams’ electric bill is $250 in peak months—30 percent higher than the norm. The Pinellas County Urban League is weatherizing Williams’ home with stimulus money from the American Recovery and Reinvestment Act, which President Barack Obama proposed in 2009. 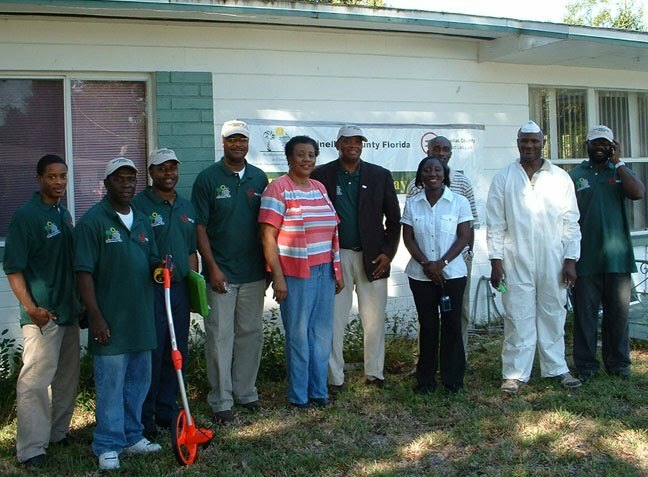 The PCUL recently received $2.6 million for household weatherization services for low-income households in Pinellas County. Williams, 60, wants lower utility bills and hopes the stimulus money retrofits will help. They include a new refrigerator, water heater, air conditioner and solar window screens. A low-flow showerhead and faucet aerator will reduce water usage. Attic insulation, window caulking and ceiling hole repairs will stop air leakage. Williams’ has lived in her 1950s St. Petersburg home for 30 years. She turns the air conditioner up high or turns it off altogether to save money. She works limited hours at the Diocese of St. Petersburg. President and Chief Operating Officer Gregory Johnson said the PCUL has been weatherizing homes since 1977 through various funded programs. In Pinellas County, 90 to 100 homes will be weatherized in November and December. Over the next two years, 360 more homes are scheduled for the process. The total number overall depends on additional funding. Johnson said homeowners qualify for the program through a short application process. The homeowner must show eligibility documentation and their income must adhere to U.S. poverty guidelines. Johnson said homeowners go on a waiting list after they have been approved. It can take up to 60 days to start weatherizing a home. Work can begin sooner depending on how many priority points are assigned to a household. Ludell Hill, director of programs at PCUL, said each qualified homeowner is entitled to receive a maximum amount of funding. “We can spend up to $5,000 per home for weatherization and then there’s another $600 in additional costs for health and safety that we can do around the house,” Hill said. Hill said diagnostic equipment is used to test the home. A blower door is a cloth door equipped with a computer and fan that measures air flow and pressure. By blowing air through the home, inspectors can detect where air is escaping. “Often times what you feel with some of these homes, the top plate was not sealed so air can come in all around,” Hill said. Hill said that a thermal imaging camera is used to test for heat. The infrared device shows heat entering the home through the attic and walls. Energy loss can occur from the duct system, which could be torn. If holes are present, then cool air escapes into the attic . Abubakar “Duke” Mensah has been a senior housing inspector with PCUL since 1994 and is specially trained in weatherization. He said a typical home inspection examines the structure of the home but not energy loss. University Area Building Contractors is one of five general contracting companies registered with PCUL that is participating in the weatherization program. James Robinson, construction manager, oversees up to three projects at one time. He works with subcontractors and a crew of five people. Robinson said it takes anywhere from three to 10 days to weatherize a home. A masonry home may not require as much work as a frame home. Robinson said there is probably more that could be done and this program gives the homeowner a good start. It also depends on the homeowner’s living habits. “At least what gets done will be a tremendous improvement,” Robinson said. “It will also stimulate jobs, which should put money back into our economy.